seashore this past February. With them was a man named Matthew Ayariga, from the Subsaharan nation of Ghana, who was not himself a Copt, but on witnessing the martyrs’ courage in choosing death over denial of their Christian faith, joined them in confessing Christ, and professing their faith as his own, saying “Their God is my God. ” The Coptic Pope, His Holiness Tawadros II, officially recognized them as martyrs, and ordered that their commemoration be inserted into the Synaxarium; their feast is kept on February 15th. Notice how the waves of the sea stained with the martyrs’ blood are shown around the edge of the image; Matthew Arayiga is distinct among the group on the top right. 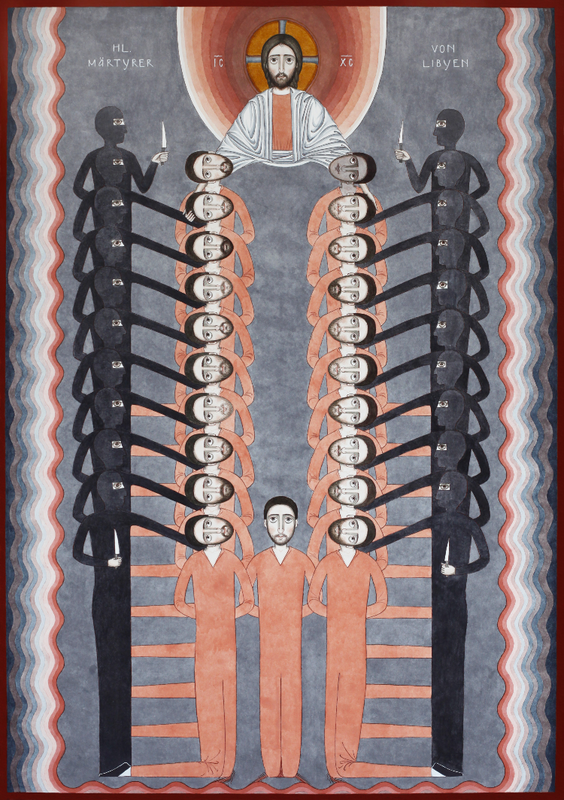 The men were killed wearing orange prisoners’ jumpsuits; all them are looking at Christ except for the one at the bottom, who is looking out at us. The original 100x70 cm watercolor is currently displayed at the Brenkhausen Monastery in Höxter, a town in the Westphalia region of Germany; this is a former Cistercian house which since 1994 has been a Coptic Orthodox monastery and the seat of the Coptic bishop of Germany. Mr Sarić plans to sell the work and donate the money to the families of the martyrs.